Supt. of Schools Dale Skinner said Tuesday morning there were numerous problems with the new bus routes on the first day of school Monday but is hopeful those problems will be solved today. 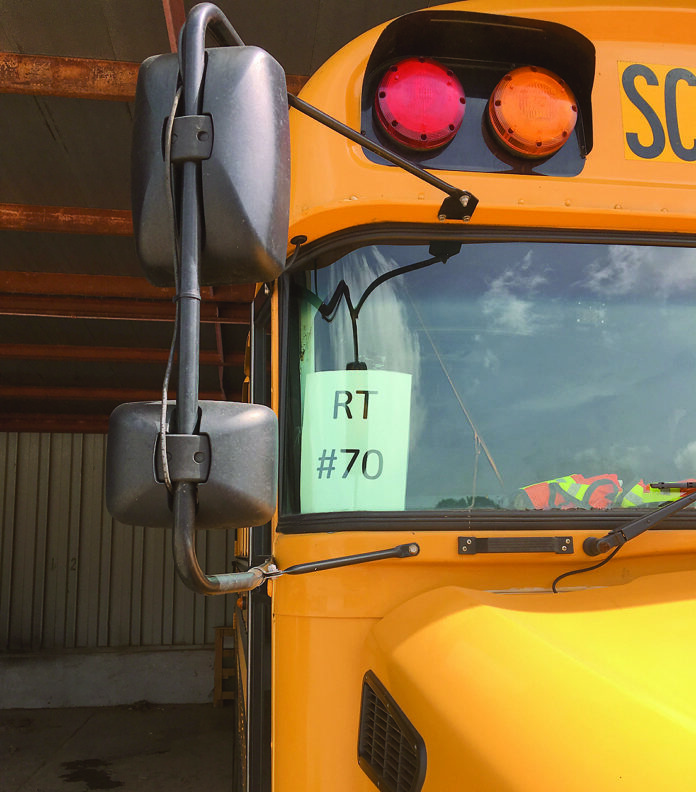 Skinner said students should board buses according to the route number that is posted on the right side of the bus windshield. Previously, students boarded buses according to the number of the bus, a practice that caused some of the confusion Monday. Skinner acknowledged that he understood why many parents were upset with the new routes and Ecco Ride Transportation system. And while some students were extra late getting home, he said the administration and principals were careful to be sure that the students were safe at all times and no one was left alone. Skinner said that despite the problems Monday, Ecco Ride has 50 new buses in operation and the remaining are no older than two years. He said that will eliminate the numerous breakdowns experienced in the past. Ecco representative Ryan Johnson spoke with Juanice Gray Tuesday morning. He said some problems occurred due to the branding because one bus may stop at more than one school. He said they utilize the bus route number because the bus may change, but the route will not. “What if this bus is out for, say an oil change, the replacement bus will still be Route #70,” he said. The window cards are temporary and will be replaced with professional placards on the sides of the bus for better visibility. The Natchitoches Times also heard from parents whose children were affected by the bus routing issues on the first day of school. As always, there are issues when there are new routes and a new company, and that is understood and taken into account. The Times reached out to some bus drivers, as well as parents, to get their take on the situation. When I was little, my mom wrote my teacher’s name and my bus number on a note and pinned it to my shirt for the first week of school. I never was left because the teacher knew what bus to put me on. Mom would sometimes even write the bus number on the back of my hand in marker in case the note got pulled off. As I got older, say third grade or so, she still gave me the note, but I kept it in my pocket to refer to until I learned the routine. That might be a common sense approach to help not only the student, but the teachers and bus drivers as well. Just a thought. Times: How was your first day back on the bus? There were some issues on the radio but it was mostly mistakes us drivers were making getting used to the new buses. People were having problems determining which bus to use since we now use the route number. We’ve always used the bus number and this change was confusing to many parents, teachers and others. I hate hearing any child was not picked up or left at school. We all honestly care for these kids and hope the parents are understanding and patient, although I know it is difficult when it’s your child. I’m hoping this new company keeps an eye on it down here like they say they will. So far they have. I got a phone call over the weekend from an Ecco Ride employee out-of-state to make sure I had everything I needed to start. I didn╒t and she took care of it and I did have what I needed by Sunday evening. •As a bus driver, I hope the parents understand we take our jobs very seriously and we empathize with every child who was left at school by mistake. Please understand, we deal with a lot of children and some are not known to us and we have no way of knowing if a parent picked the child up from school, took them to school on the first day or whatever. Times: Did you run your routes prior to school starting? •They gave us the option to. •I didn’t since this is my XXth year on this route. •Yes, but without actually picking up the students, we could not put a face to address and some of the students we don’t personally know. We met many on the first day. Times: Do you have any insight into what happened or how it can be addressed? •All of our bus numbers and route numbers changed. Also they restructured many of the routes. •The company made some changes and no one ever does well with change. Hopefully all the issues are ironed out today and we have a smooth school year from here on out. •Not all of the bus drivers were given new route sheets. With the changes to some of the routes it was impossible to know where they were supposed to be and that’s unacceptable. •Most of it is being blamed for a new company coming in and not having enough time to get it all done. •I’ve driven a bus a long time and this happens almost every year. Yes, it is horrible for the students who were left at school or not picked up and we all apologize for that. It should not happen and in a perfect world it wouldn’t, but in real life it does and we make every effort the problems that arise on day one are corrected as soon as humanly possible. Next articleTHOMAS WYLIE MERRILL JR.